Most bicycles, except some tubeless models, use tubes in their tyres. Tubes are used to hold the air in, of course, while the (outer) tyre is responsible for firmness and grip with surface. 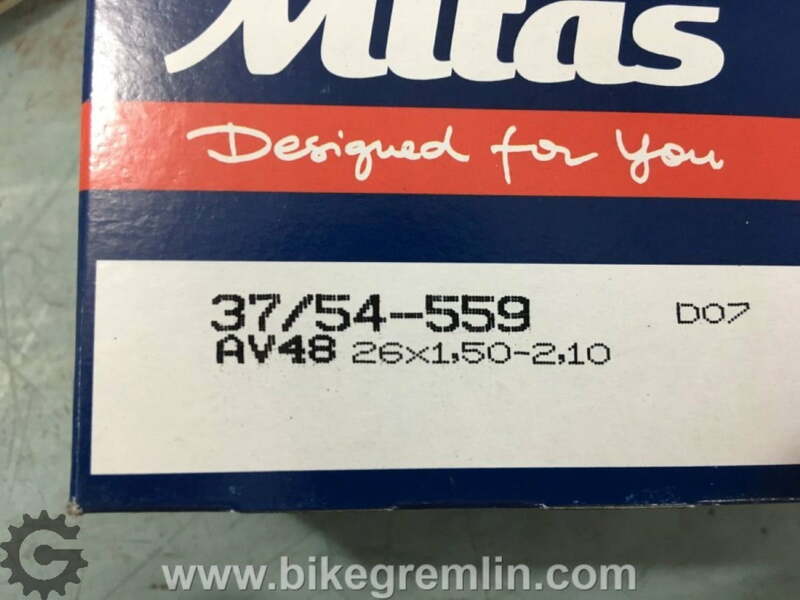 This post will explain important things concerning bicycle tubes, including: dimensions (sizes), valve types (schrader, presta, dunlop…), valve lengths etc. Good quality tube needs to be made of good rubber in order to hold air well. It should also have a good quality valve. Valve itself should have threads to hold a screw that keeps valve in place, even when the tube is deflated. (Schrader) valve without threads (except for the cap). In case the tube is deflated, one will have trouble pushing pump onto the valve. 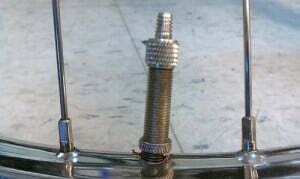 Threaded valve with a nut to keep it in place even when the tube is deflated. Nut prevents the valve from dropping in when the tube is deflated. It, however, should be kept loose, not tightened, since when tightened it tends to rip the valve core from the tube inside. Tubes are rather flexible, so one size of tube fits wider range of tyres (with a range in tyre width, as well as wheel diameter). Manufacturers usually state which tyre dimensions does the tube fit. If a proper fit can’t be found it is a rule of thumb that a size smaller is better than a size larger tube. 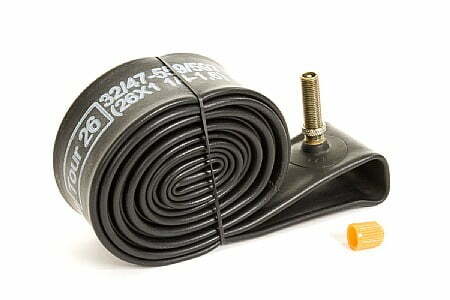 Larger tube will be harder to fit beneath the tyre and might not stretch properly when inflated. Tyre dimensions are explained in the post: Bicycle tyre sizing and dimension standards. 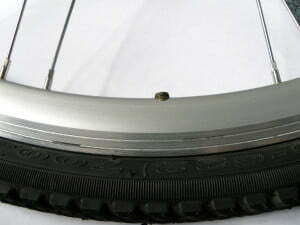 Manufacturer noted the range of tyre widths that this tube is made for (37 to 54 mm), as well as the rim (and tyre) diameter the tube fits (559 mm). Manufacturer listed the (standard) tyre dimensions that this tube fits. Note that it fits both 622 mm rim diameter tyres, as well as 630 and 635 mm ones. For a range of various widths. One should also pay attention to valve length. Deep rims require longer tube valves, while thinner rims look awkward with long tube valves sticking out of them. This valve stem is too short for this deep aluminium rim. It will be quite difficult to inflate this tube. This valve stem is too long. It sticks awkwardly long from the rim. A few cm shorter would be much better. Of all the valve standards, three are still widespread in use: dunlop, schrader and presta valve. Also known as “Woods” and “English” valve. Widespread in developing countries, as well as Japan and some parts of Europe. This valve is outdated, but still popular in developed countries. 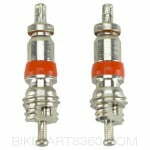 Valve width is close to schrader valve, so can be used on the same rims. It can be inflated with a schrader compatible pump, if a schrader adapter is mounted. 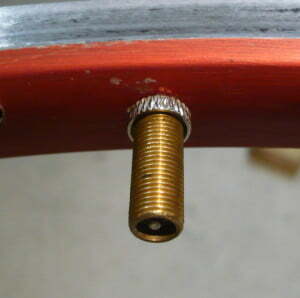 Schrader adapter is the same for presta and dunlop valves. 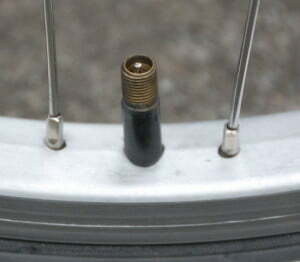 A commonly used valve, seen on most car tyres, as well as many mountain bicycles. It has a core that is replaceable. 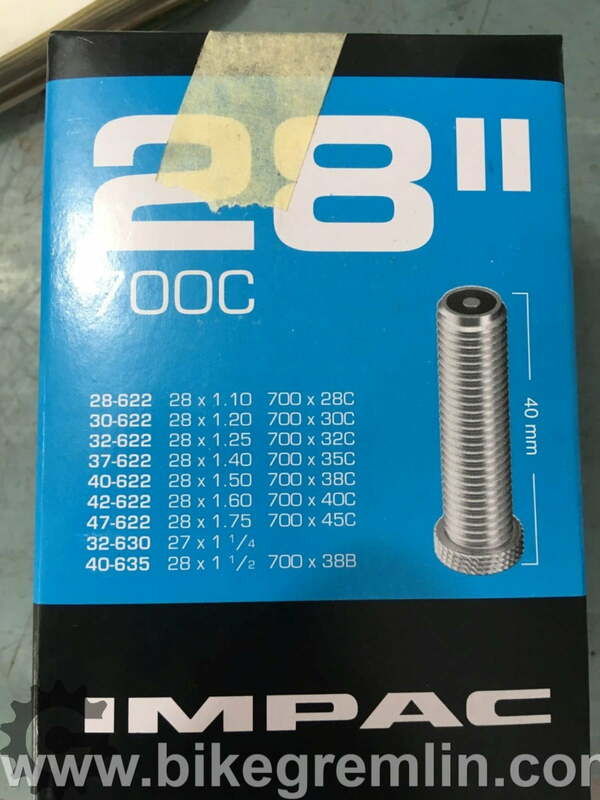 It is recommended for most uses, except when a rim is very narrow, so that thin, presta valve must be used. Two schrader valve cores. They can be replaced when not working well (worn, or damaged). 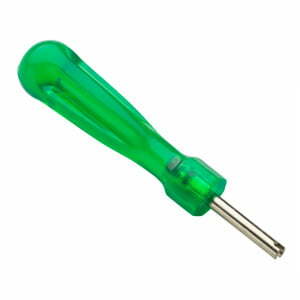 Tool for replacing schrader valve cores. Unless there is a specific reason to use thinner valves, tubes with schrader are probably the most convenient. Left to right: closed presta valve, opened presta, presta with a schrader adapter, schrader valve. Advantage of presta valve is that it doesn’t have a strong spring that a pump needs to overcome. It is easier to inflate. It is also thinner than the other two – convenient for thin racing rims and wheels. Pumps for presta valves can also be made in smaller dimensions than schrader pumps. When inflating presta valve tubes, a locking nut should be unscrewed by several turns (picture above shows closed and open presta valve). Then the valve head should be pressed down once (letting out a bit of air if the tyre isn’t completely flat), to free the valve seal for inflation. After inflation, the locknut should be screwed tightly to prevent air leakage. The core of presta valves can be replaceable, but they are seldom produced with replaceable cores. Only a few manufacturers (e.g. 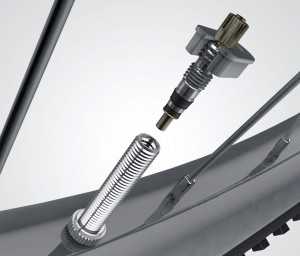 Schwalbe and Continental) produce presta with replaceable valve cores. Removable presta cores can be identified by two wrench flats on the coarse valve cap threads. Rims have either wide valve holes for schrader, or narrow ones for presta. 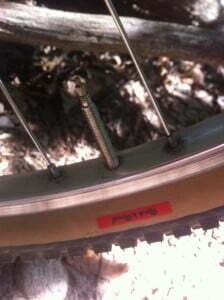 It is not wise to put presta in a wide hole, and it is not possible to put schrader in a narrow presta hole. So by choosing a rim, the choice is made for one of the two modern tube valve standards.